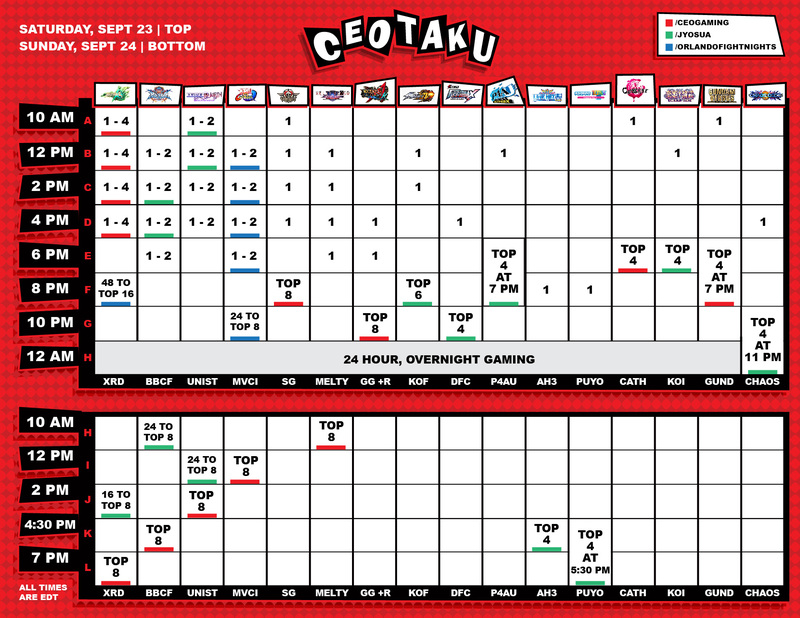 Welcome back to the 3rd annual CEOtaku Anime Fighting Game Tournament. 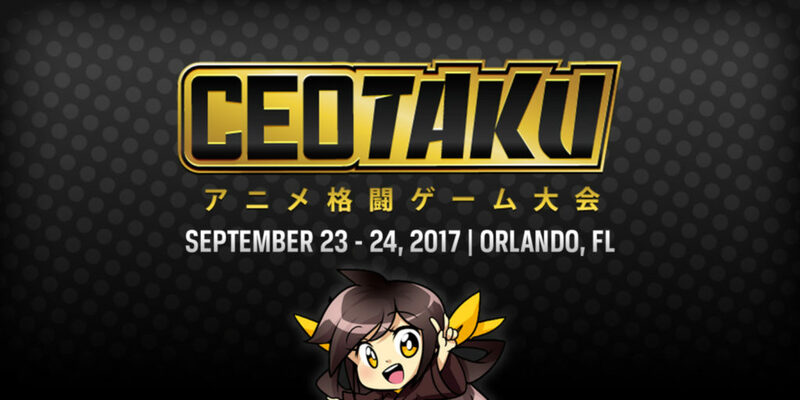 This is a CEO tournament experience showcasing the best players from the Anime Fighting Game Communities. I’d just like to say thank you to everyone for supporting this event and traveling in from over 40 States and 11 Countries to the event! We have over $12,000 in prize money to be won across 16 games. One of the biggest dedicated Anime Fighting Game Tournaments to date! I’ll start with the important stuff. 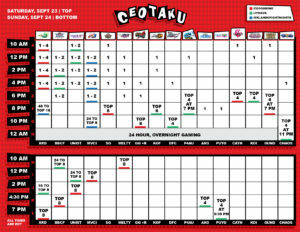 We hope this guide helps you make the most of your experience at CEOtaku. How can I get to the venue (Wyndham Orlando Resort, 8001 International Dr. Orlando, FL 32819)? Uber and Lyft can now pick up from the airport! Mears Shuttle has One-Way (around $21.00) and Round Trip (around $33.00) tickets per person you can book through here in advance to get to the Wyndham : https://shuttles.mearstransportation.com/. You can find them on the Transport Ground Level inside of MCO. I’d reserve through that link once you know your landing time. We will have a badge pickup line for registered players and spectators in front of the Palms Ballroom Main Entrance all weekend. Please pick up your badge at least one hour before your scheduled start time if you are competing.To pickup your badge please bring a Photo ID or a printout/picture of your PayPal receipt to collect it. 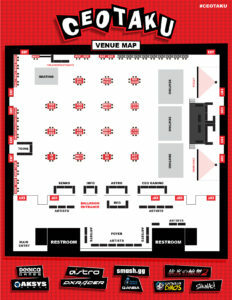 Please keep your badges or wristbands visible at all times or you will not be allowed into the Palms ballroom. Be sure to check in at least one hour before your pool start time. If you pre-ordered the Official CEOtaku shirt you’ll pick it up with your badge as well. We’ll have a limited supply available on site as well for $25 each at the CEO Gaming Booth. What time do I need to be in my tournament pool and what is my pool number? If you registered to compete at CEO, here is a link to all of pools on Smash.gg. You can also quick search your tag on smash.gg/tournament/ceotaku-2017/attendees and it will tell you your pool times. Please be sure to show up at least 10 minutes before your scheduled pool time at the station to check in with your judge. All tournaments take place inside of Palms Ballroom at the Wyndham. 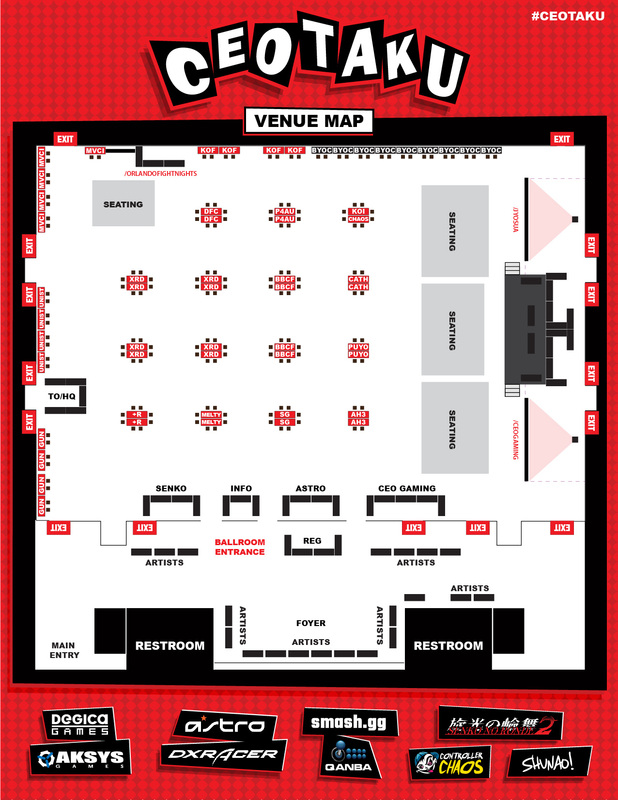 Check out the Venue Map and schedule below for details. Can I still buy a Spectator Badge or Day Passes? We will still be selling On-Site Spectators badges (w/ Badge and lanyard) for $25 for Saturday or Sunday or $40 for both days including BYOC, Free play on stations when not in tournament use and 24 hour ballroom access. Children under 12 and under are free with a poaying accompanying adult. We accept cash, as well as credit cards(3% fee will be added) at the Spectator Registration line. Tournament Pools and Brackets will be finalized Thursday evening so check back Friday afternoon in case there are any changes. If you are doing emergency on-site registration, please check the brackets Friday at 9 pm for your placements. Please be aware of your pool times so that you are not late or you will be Disqualified and sent to losers the first time, then eliminated if you miss your 2nd match. Plan to show up to your stations at least 10 minutes before the pool start time. Emergency On Site Registration is extremely limited so it’ll be on a first come first serve basis from 6pm until 9pm Friday night at the registration desk. After this no more registrations for official tournaments will be allowed. Any commun Below are total number of players and number of spots left before hitting the cap. We have a couple pot bonuses courtesy of Developer support listed below! Prize Payouts! Here are the payouts! All tournaments will have a standard ruleset of 2/3 rounds unless otherwise noted, default timers and winners keep same character or assists. Only Winners Finals, Losers Finals and Grand Finals will be 3/5 for all games. If you have any questions please ask your TO or judge. Skullgirls and Marvel Vs. Capcom: Infinite will be 3/5 the entire tournament. Guilty Gear XRD Rev 2 Top 8 will be 3/5! All other finals will be 2/3 until Winners/Losers and Grand. 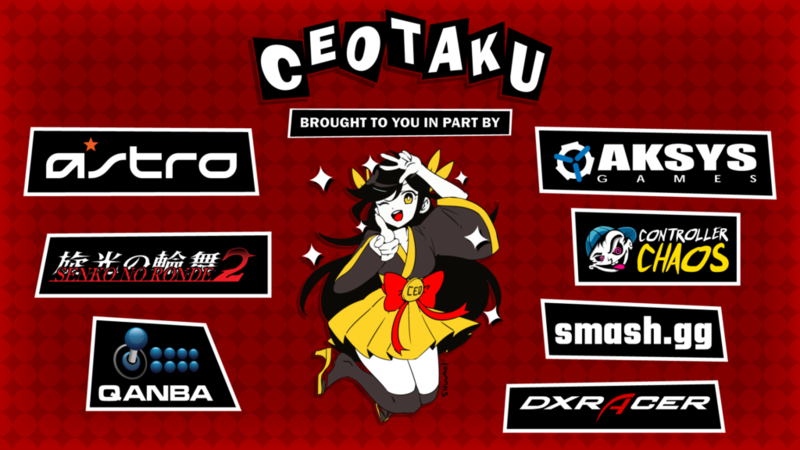 Stickerdork will be running the official CEO Gaming Booth selling lots of cool stuff such as the Official CEOtaku 2017 T-Shirt, past CEO merchandise at a discount and more! 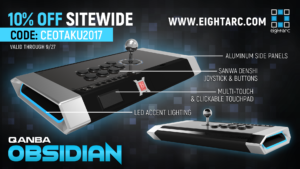 Our friends over at Eightarc are offering 10% off of any purchase with the code “CEOtaku2017” until September 27th so be sure to take advantage this weekend. Senko No Ronde 2 Development team in the house! Be sure to drop by their booth this weekend and say hi and check out their latest game. Aksys Games Community Manager is also here supporting the event! Official CEO Gaming Store now open for business! 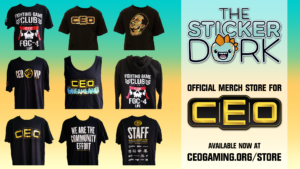 We’ve now launched the CEO Gaming store selling previous merch if you missed a previous event. CEOtaku 2017 shirts will be for sale after the event is over this weekend. Use Promo Code “Jebaited” for a special discount this weekend. Bring Your Own Console area. We have plenty of space this year for community setups to play and enjoy whatever you’d like. We’ll have about 16 monitors provided so they will be on a first come, first serve basis. Power will be laid out if you’d like to bring your own complete setups as well. 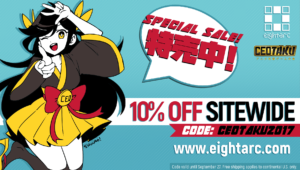 Did you know you get 10% off at a few places with your CEOtaku Badge? 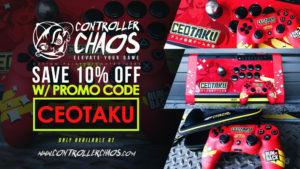 Popeye’s, Blazing Tomato and Coldstone Creamery are offering 10% off to CEOtaku attendees with your badge this weekend! This does not include alcohol. What else is there to do around the venue? Over 50 restaurants and places to see within .5 miles of the venue so you’ll never go hungry. There is also a Starbucks, WaWa convenience store/gas station, and 24-hour Walgreens on the hotel property! -Listen to staff please. Everyone is working super hard to ensure things run smoothly. If you have any problems with staff or other players, please find Jebailey. -Don’t forget to bring your own controllers, converters, etc. for all tournaments. Be sure to let players that play after you know to delete your controller from system memory in the settings if you use a PS4 Dual Shock 4. -When you get your pools and pool schedules please do not be late. -NO outside food in the ballrooms or Alcohol of any kind. Drinks such as sodas or bottled waters are fine; just keep them off the stations. If you’re caught with any alcohol in the ballrooms, you will be removed from the event. The pool area has Gatorville, a full bar and restaurant, open until 11 PM every night. -NO GLASS at the pool. If you plan to drink anything out and about, please only have plastic. Security will call me to yell at you. -NO VAPING IN THE BALLROOMS. Just NO. -And as always: It’s Florida, remember to shower and be hygienic, we want everyone feeling comfortable. If you sweat through all your clothes, feel free to buy more CEO T-Shirts to get you through the weekend. CEO is all thanks to you: the fighting game fans and community.